Y’all remember this song about Valentine’s Day, don’t you? For sure you do. It’s none other than “Old Blue Eyes” Frank Sinatra, from his 1954 album Songs for Young Lovers. Actually, it was written by Mitzi Green in 1937 for Babes in Arms. It has been performed by over 600 artists. Interesting but who cares? Sinatra’s rendition is timeless, and “My Funny Valentine” can easily become your latest earworm. Stories are apocryphal and vary about the origin of the subject of “My Funny Valentine,” how Valentine’s Day began and why it’s celebrated in mid-February, and so on. Perhaps the most common reckoning involves this account of a Roman emperor and a priest of Rome: Claudius II, a/k/a Marcus Aurelius Claudius Gothicus, who served as Roman Emperor when Rome had a serious migrant problem. Goths and Vandals had been sneaking through Rome’s borders and wreaking havoc and Claudius won’t be having none of that. During his brief tenure (268-270), he vanquished the Goths and had just wheeled about to trounce the Vandals when he died of the plague. To get the job done, Claudius needed the best soldiers, and the best soldiers, in Claudius’ mind, were unmarried, unattached to a wife and family. So Claudius simply outlawed marriage, leaving the soldiering to the single dudes. Enter one Valentinus, priest of Rome and chief mischief-maker, who began secretly marrying young lovers who preferred making love to making war. For that bit of rebellion, the martyred Valentinus lost his head but was later “rewarded” with sainthood. He became St. Valentine. It is he who is most commonly associated with Valentine’s Day. It may be that Valentine’s Day is celebrated in mid-February to commemorate the anniversary of St. Valentine’s death. However, another theory regards the mid-February Roman celebration of Lupercalia, a fertility festival where Rome’s bachelors were paired with unmarried females for one year. Though nothing required it, most such arrangements apparently did end in marriage. Nonetheless, the Catholic Church looked askance at that “pagan” business and sought to Christianize it by associating it with the mid-February, Saint Valentine’s feast day. Maybe it sounded better in the original French. Charles wrote the poem in 1415 to his wife, Bonne. Bonne of Armagnac was 11 years old, Charles 16, when they entered into what was Charles’ second marriage (his first wife died in childbirth). Charles was next in line to the throne of France. But he suffered the misfortune of fighting on the wrong side in a battle during the Hundred Years War, was captured by the British, and was “entertained,” in various places under house arrest for the next 25 years. Charles was 46, and being “hosted” in the Tower of London when he penned “Farewell to Love” for his Bonne. Whichever account is accurate about February 14, it began taking root as a day for love and romance right about the time old Geoffrey Chaucer and his groupies were on the scene. It was sometime during the 14th century. 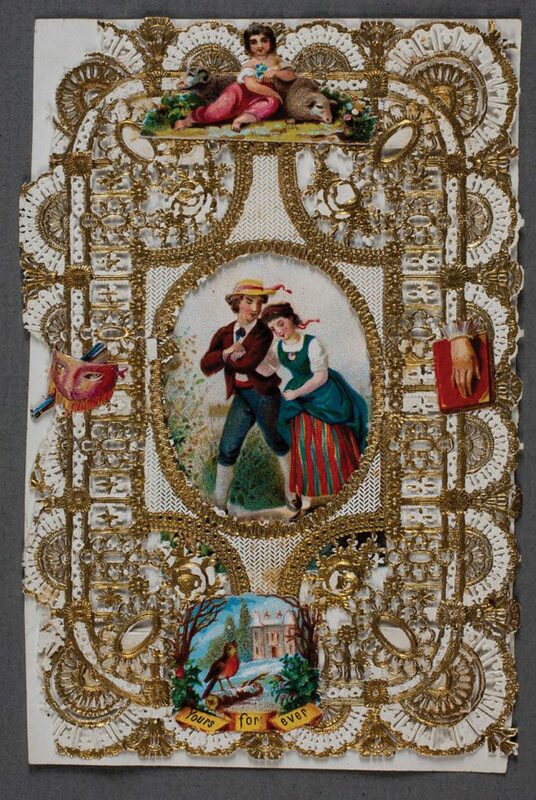 Whenever, friends and lovers began slipping each other hand-drafted notes of affection on Valentine’s Day. Quickly thereafter things got rolling, chop-chop. Printing technology improved. Merchants, as always, began sniffing money afoot. 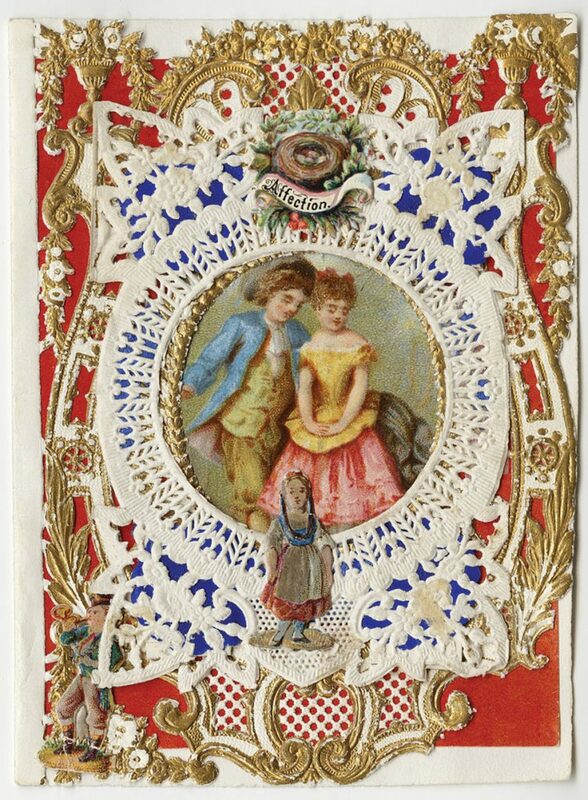 Mass-produced printed Valentine Day cards were just slightly below the radar. 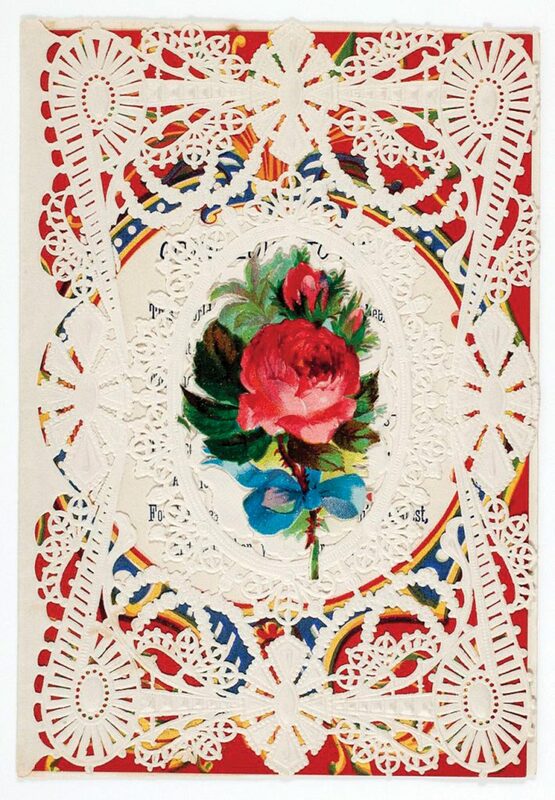 In 1847, Esther, daughter of a wealthy Massachusetts printer and bookseller, became smitten with a lace valentine she had received from England. She mused about how nice it would be to print (and sell) similar cards — which she did, in spades. 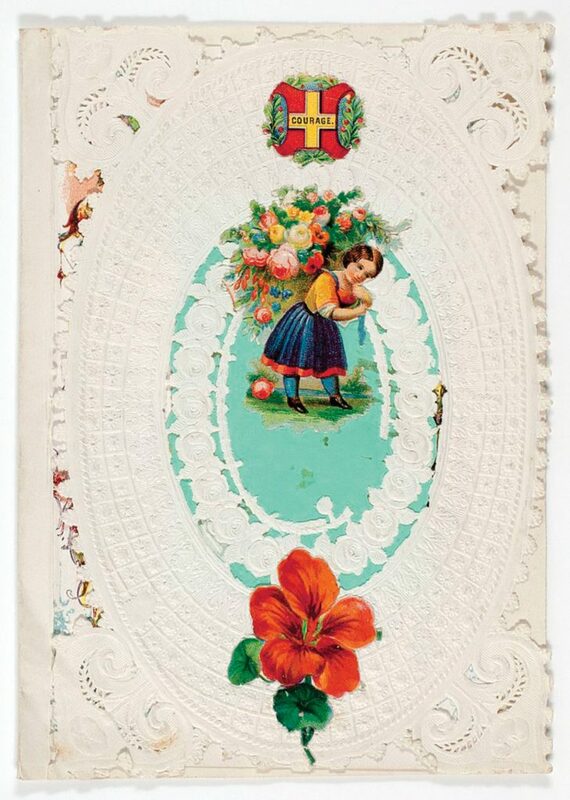 Esther designed her cards then set her brother out on a selling trip, samples in tow. Brother’s promotional jaunt paid dividends. In today’s pop-jargon, the thing went viral. He returned with orders amounting to $5,000 ($150K in today’s scratch). Esther was the quintessential capitalist. She and her friends promptly set up an assembly line operation in her home. Esther’s little biz speedily grossed an astounding $100 grand ($3 million today). In 1880 she sold her business to George Whitney Co. She lived, unmarried, by the way, till 1904. Ms. Esther Howland set in motion a fast-moving avalanche of Valentine’s Day commercialization just in time for Al Capone’s St. Valentine’s Day Massacre. But that’s another story. In 2018, Americans spent a whopping $19.6 billion on Valentine’s Day stuff. Expenditures for jewelry topped the list, then, in order, came an evening out, flowers, clothing, gift cards, Valentine’s Day cards (now the second biggest day for cards, following Christmas), and candy. Some may surmise that much of what is spent is spent from pressure. Personally, a handwritten note and a romantic evening at home would be my preference. Maybe crank up Songs for Young Lovers, listen to Old Blue Eyes’ “My Funny Valentine,” or something. Michael Smith lives in Talamore, Southern Pines, with his wife, Judee. They moved here in 2017 and wished they had moved here years earlier.